Above, Toronto City Hall in Ontario, Canada: 311 is the phone number to use within the City of Toronto for info. The construction, which began in June, involved track reconstruction at several key locations, modification of the passenger platforms and shelters, and modernization of the overhead power system in preparation for the arrival of the TTC’s new low-floor streetcars. Construction work to extend the PATH pedestrian tunnel network from Toronto’s Union Station will result in a series of road and lane closures for Front Street, York Street and University Avenue during the remainder of this year and into 2013. The work, which is being carried out in co-ordination with the Union Station Revitalization Project, will improve pedestrian access to and from Union Station and across the busy intersection of Front Street, York Street and University Avenue. – The section of University Avenue extending north from Front Street for about 30 metres will be reduced to a single lane northbound from November 19 until January 2013. 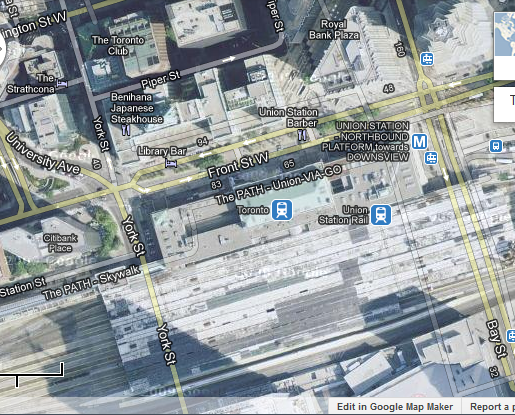 – Front Street east of York Street will be closed in both directions from January to October 2013. – Motorists travelling westbound on Front Street from Bay Street will need to make a U-turn east of York Street and return in an eastbound direction. Motorists travelling eastbound on Front Street from Simcoe Street will be required to turn left onto University Avenue or right onto York Street. Left turns are not permitted from Bay Street to Front Street. – As a result of the construction work, motorists who need to access the Royal York Hotel should travel westbound from Yonge Street. – Vehicle access to Union Station is available via Bremner Boulevard. – York Street from Front Street to Piper Street will be closed from January to December 2013. Pedestrian access will be maintained during the road closures. Some sidewalks and pedestrian pathways may need to be closed for safety reasons when work is taking place overhead. The north crosswalk across York Street and University Avenue will be closed from November 19 to January 2013. Pedestrians will need to use the south crosswalk. Six Finalists of Tunnel Boring Machines Naming Contest: Vote Before Nov.21, 2012!